A doctor from Cardiff and Vale University Health Board’s Clinical Research Facility has been awarded a prestigious award from the Association of British Clinical Diabetologists (ABCD). Dr Mohammad Alhadj Ali picked up the 2018 training award from his work on immunotherapy for Type 1 diabetes. Dr Alhadj Ali presented at the annual ABCD trainees meeting in London and was the co-winner out of four presentations that were shortlisted for the award. 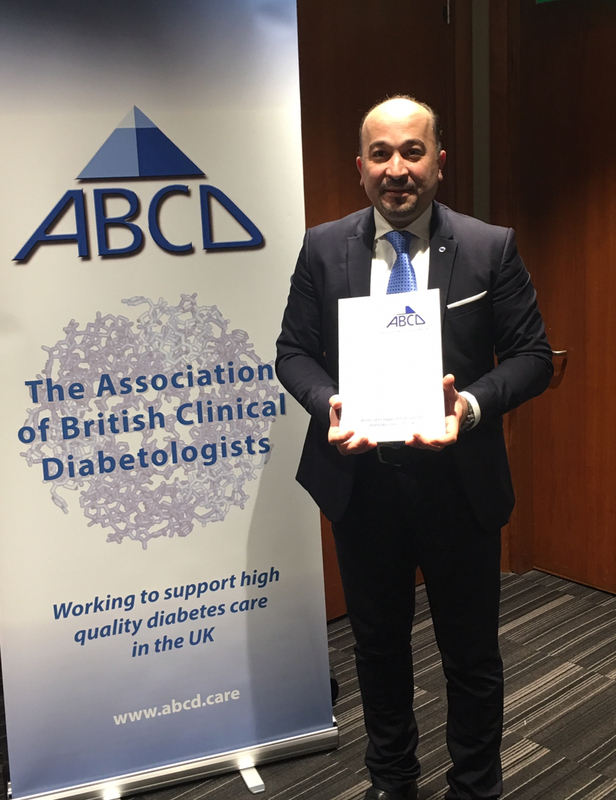 Dr Alhadj Ali said “I am thrilled and honoured to have received the Training Award 2018 from Association of British Clinical Diabetologists in London. Dr Alhadj Ali had been instrumental in Type 1 Diabetes clinical research and is part of the Diabetes Research Group at Cardiff University. He has also been the lead clinician in dosing the first two patients in a world first clinical trial which aims to regenerate cells in the pancreas so that people with Type 1 Diabetes become less reliant on insulin. ABCD was established in 1997 with the principal objective of ensuring high quality care for all UK diabetes patients. ABCD is a professional organisation committed to the preservation and support of diabetes specialist care services.